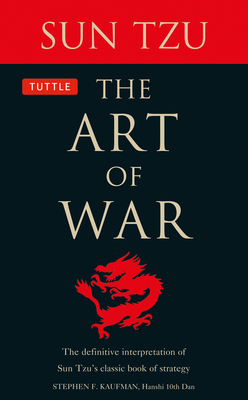 Learn the strategy and philosophy of China's most celebrated military theorist with this highly readable and informative edition of The Art of War. The Art of War by Sun Tzu is the best known and most highly regarded book on military strategy ever written. Although its wisdom is from ancient China, its principles and advice are timeless--as applicable in the boardroom as they are on the battlefield. Unlike contemporary translations that have focused too heavily on applying this military classic to corporate conflicts, this definitive interpretation maintains the impact of the original. Written for martial artists by a martial artist, it is free of academic commentary and ambiguous metaphors, as Hanshi Kaufman uses straightforward prose to explain Sun Tzu's message. Like the original, this new interpretation is divided into thirteen sections, each presenting vital information on military strategy ranging from assessing opposing armies and the proper treatment of troops to the use of spies. Stephen F. Kaufman, Hanshi, 10th Dan, is the holder of the highest title and rank attainable in the martial arts. His martial system, Hebi-ryu ("School of the Snake"), is recognized as one of the most effective martial methods in the world. A career spanning close to 60 years began in Okinawa in the 1950's. He's acknowledged as the "founding father" of American karate and has received countless awards and honors, including an induction into the World Karate Union Hall of Fame as Author of the Year in 2011. Kaufman has authored and interpreted many martial arts titles including Musashi's Book of Five Rings, The Way of the Modern Warrior, and The Shogun's Scroll, all available from Tuttle Publishing.